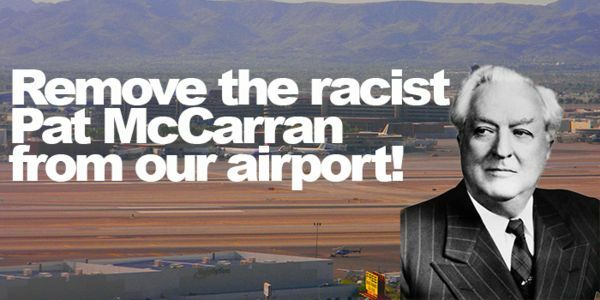 texte de la pétition: Change The Name of McCarran International Airport! Former Senator Pat McCarran leaves a dark cloud of racism and anti-Semitism that has no place in our state, especially at the welcoming point for millions of international visitors from every walk of life. The time has come to take McCarran's name off of the Las Vegas airport and rename it the Harry Reid Las Vegas International Airport. We believe that the best name for our airport belongs to someone who has left a true legacy of fighting for Nevada. Senator Harry Reid has a long list of accomplishments, including being instrumental in shaping the Las Vegas Valley into a world class destination. Senator Reid secured billions of dollars in direct appropriations to aid in the expansion and modernization on McCarran International Airport. During the great recession, Senator Reid led the effort to obtain 2.4 billion in funding necessary to develop a new Terminal 3 at McCarran Airport. This expansion was necessary to meet the demand of international travelers to Las Vegas. Most importantly, Senator Reid has been a devoted son of Nevada and raised his family to be the same. Sign and urge the Clark County Commission to vote to officially change the name of McCarran International Airport to the Harry Reid Las Vegas International Airport. We, the undersigned, request that the Clark County Commission vote to officially change the name of McCarran International Airport to the Harry Reid Las Vegas International Airport. First and foremost, the time has come to take McCarran off the name of our airport. Former Senator Pat McCarran leaves a dark cloud of racism and anti-Semitism that have no place in our state, especially at the welcoming point for millions of international visitors from every walk of life.